Welcome our new Golden Hawks! During orientation week, we are welcoming a new class of first-year students to our Waterloo and Brantford campus communities with a series of orientation events taking place Sept. 3-9. 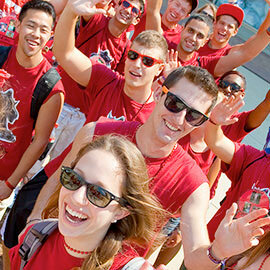 The Wilfrid Laurier University Students’ Union has organized an Orientation Week schedule that focuses on introducing first-year students to Laurier and allowing them to experience first-hand the culture that makes our university so special. O-week events will help our first-year students learn how to balance elements of student life while achieving academic success, enjoying life in the cities of Waterloo and Brantford, and understanding the importance of Laurier’s student body in our communities. The Laurier Students Public Interest Research Group will run Radical Orientation Week Sept. 11-15 to provide resources and introduce students to organizations doing social justice work at the university.